- Designed by Philip F. Spaulding & Associates of Seattle. - Her keel was laid Jan 12, 1959 at the Puget Sound Bridge & Dry Dock in Seattle. So, this is an old but a famous ship with some history built into it. M. V Coho is a “ Vehicle and Passenger Ferry” that sails between two cities - Victoria, BC downtown and Port Angeles in Washington State. It has a capacity for 1000 passengers and 115 vehicles so it's not a small boat. It’s like a road that connects two cities - Victoria BC Canada and Port Angeles Washington USA. They have four sailings from both sides during the summer, but less frequent during the rest of the year. The ferry crossing takes 90 minutes. When travelling between two cities most tourists bring their vehicles, so they get to be in the comfort of their own vehicles. Nevertheless, those who are visiting Victora find that we have an excellent public and private transportation system as well. The Black Ball ferry terminal in Victoria is located right in downtown (walking distance to Parliament building and Empress Hotel). This is such a convenient location for all its travelers. The ferry terminal is located in one corner of the downtown. 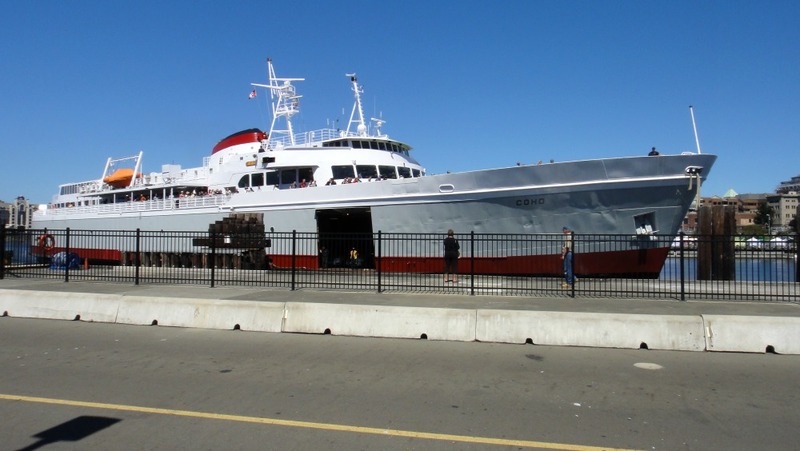 All ferry passengers can easily walk to any location in downtown Victoria such as restaurants, buses etc. Within minutes. Our home town is Victoria. 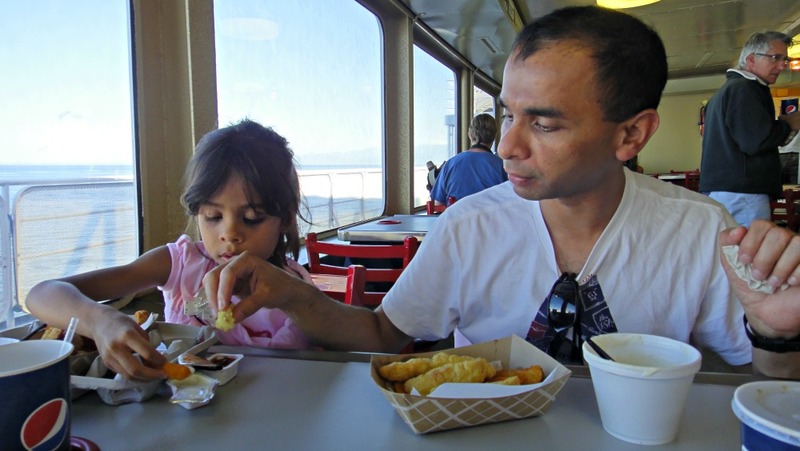 On a beautiful sunny Saturday, during the summer we sailed Coho ferry to USA. We have taken BC Ferries to Vancouver and drove to Seattle several times. It was a quick decision that we decided to change our routine route to Seattle and try the Coho ferry route via Port Angeles to Seattle. We thought why not try this scenic ferry route from downtown Victoria to Port Angels USA and then drive to Seattle from there. We knew specially in the summer time ferries are busy and fill up so quickly. Saturday morning we called the ferry line to reserve a spot. It's too bad, we couldn't buy tickets online or over the phone as all the reservation spots were sold out. However, they said there are always some spots available for non reserved vehicles and encouraged us to give it a try. According to the ferry policy online reservations close 12 hours before the departure and phone reservations are available up to one hour prior to sailing (if spaces are available). They also mentioned to us that sometimes online reservation spots are over days before the sailing. Remember, that there is a lineup for first come, first serve basis spots too. 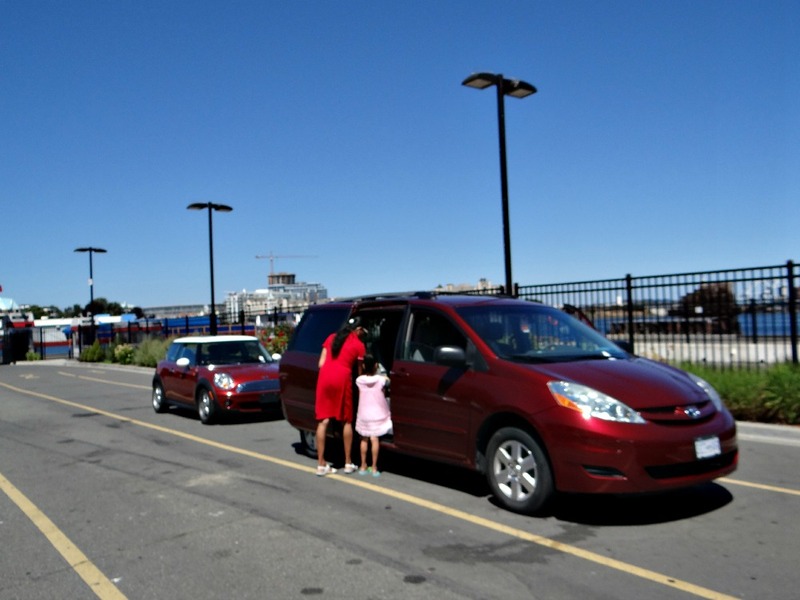 First come, first serve travelers have to park their vehicles in the unreserved lineup at least couple of hours ahead. So what did we do? Quick, Quick and Hurried up…., grabbed our luggage and rode to the terminal. Hoping to see if we are lucky enough for one of those “first come first serve spots”. We were there at 12.30pm for the ferry sailing at 3.00pm. When we reach the terminal, for our disappointment, we found out first come first serve lane is also full. Yet, the friendly staff told us that they accept a few more cars for the standby lane too. So we were glad, at least there was a possibility. You see... Here It's bad timing and we did everything late on a busy Saturday. Are You a Walk-On Passenger or a Bicycle Passenger to the Ferry? Victoria and Port Angeles, both Coho ferry terminals are right in downtowns. This makes walking and biking affordable and easy. Bicycles are loaded with walk-on passengers. So no need to reserve a spot. Please remember even if you have a reservation, you should arrive at Victoria terminal 90 minutes prior to departure to go through Immigration clearance by US Customs. From Port Angels terminal at least 60 minutes prior to departure. Please make sure you have all your travel documents ready to avoid any disappointments and delays. Around 1.30pm Ferry staff started walking along the lineup, checking our passports. They were very nice and helpful. Boarding started at 2.30pm. Finally, when we made it to the ferry. We parked our vehicle right at the ferry entrance door because our vehicle and two other vehicles were last to get in. If you decide to travel first come, first serve basis, you can still call to find out how soon you need to arrive to secure a spot at non-reserved vehicle space. You can drop your vehicle and hang around the city until its time to issue tickets. Victoria downtown is a vibrant place. During warmer months, there’s lots to see in the city. While we were waiting for the ferry, we saw “Hippo Tours” (Bus or Boat or BUSBOAT however you like to call it) a cute amphibious vehicle sailing in the water. We watched “Prince of Wales” whale watching boats coming and going. When you reach the terminal and find out that all non reserved spots are gone and you need to stay on the Standby lane (this is what happened to us). This means your spot is not guaranteed till the last moment. And so I recommend holding an alternate plan B or C available to you. You can take the Anacortes Ferry to Anacortes, USA or take BC Ferries to Vancouver and then drive to USA. 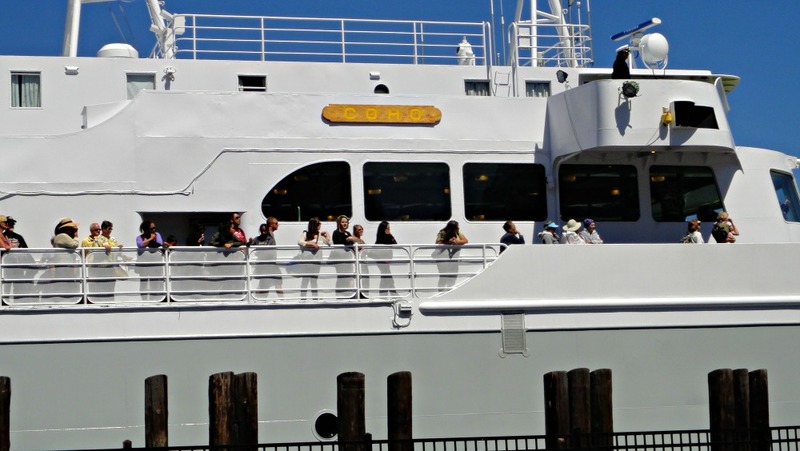 However, If you really like to sail Coho ferry, my opinion is to buy tickets online or over the phone to reserve a spot for your vehicle. Please note - Coho Ferry takes an annual maintenance break. Usually mid January (19th.. 20th) to first week of February 4th...5th). Travelling Coho is all new experience for three of us. We explored, walked around the deck and inside. 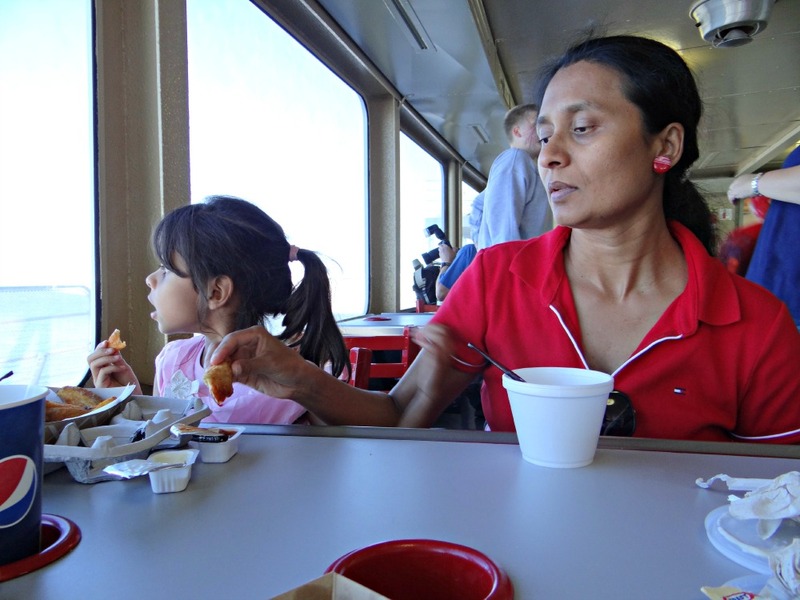 Feeling hungry, next we entered the ship’s cafeteria. It is a nice place to sit down and take the lunch, dinner or a snack. Prices are affordable too. 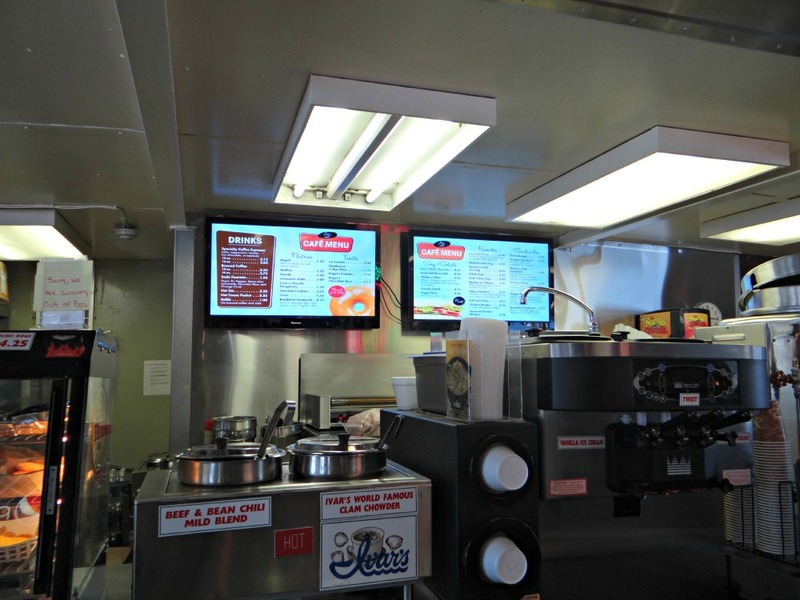 Hot Hot chili and their famous clam chowder look mouth watering. We didn't buy chili because our daughter Lapaly doesn't like to eat chili. We ordered clam chowder, Chicken strips, fish and chips…. Yummy yummy stuff.... We were totally happy and enjoyed our meals. Coho has a duty free shop that sells liquor. There is also a gift shop with nice goodies to make your gift ideas memorable or just something to treat yourself. We noticed always there are people gathering around the duty free shop. 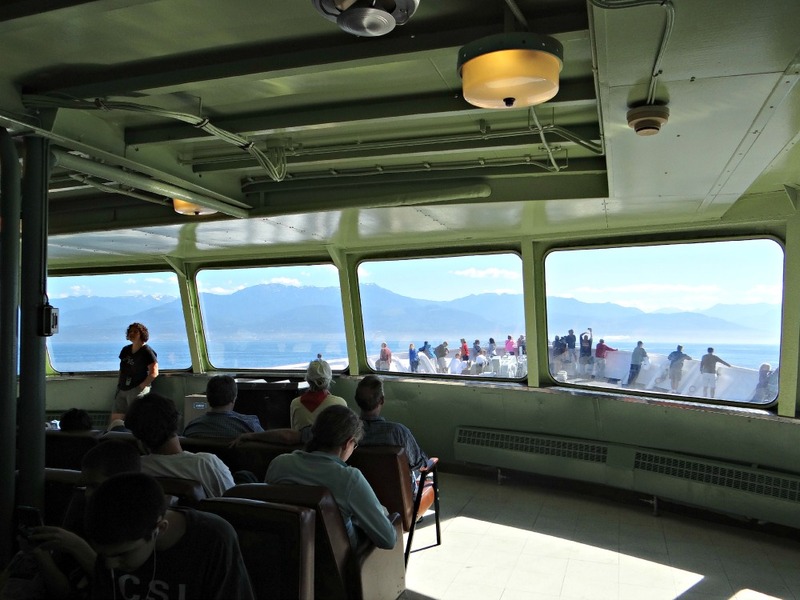 It was a thrilling bumpy ride crossing the Juan de Fuca Strait to Port Angeles. We don’t know it is just a another windy day or a “Perfect Storm” or perhaps the ride is always like this. This is quit a different ride compared to BC Ferry ride. The Big boat started to Sway Surge and Roll. We felt like riding a seesaw at one point. This was my daughter's favorite part of the whole journey. We enjoyed it very much too. Lots of people were gathered in front of the vessel. It is a place to enjoy the scenic view and the ride as well. This vessel has a nice and warm observation area inside, we can see the beautiful Olympic mountain range right in front of us when reaching Port Angeles. It is such a beautiful scenic view. Beautiful Olympic Mountain Range. You see, People Standing in the Very Front of the Bow - Exciting Spot to be In! 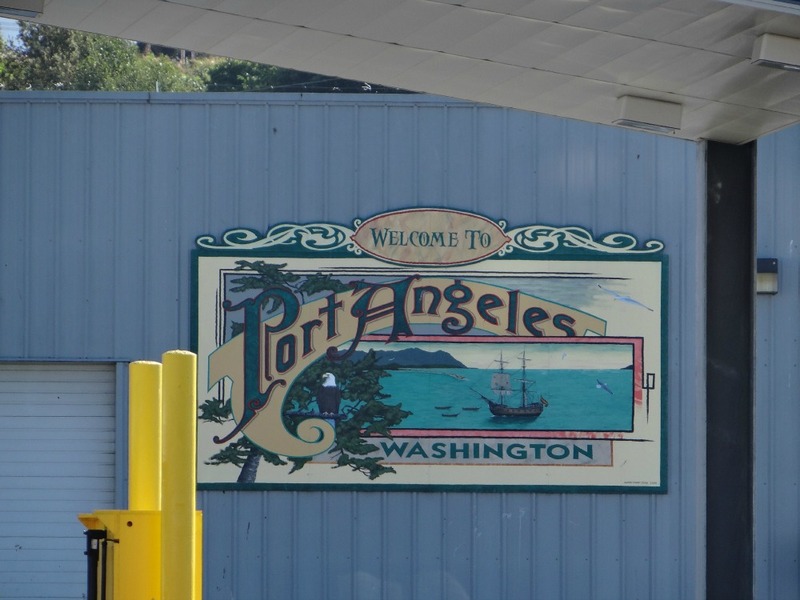 To get to Port Angels takes only 90 minutes. We went through customs really fast.